Forget the Prime Evils, players have yet to defeat the log-in screen. 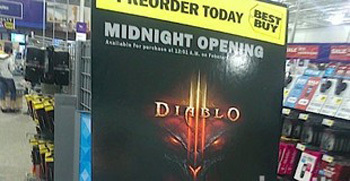 Most major releases have at least a few issues on launch day, whether it's the need for a large patch to fix last minute problems, or just a long line to connect to a multiplayer server. As it turns out, Diablo III is no exception, as players are unfortunately encountering a host of issues, including full servers, performance problems, and the infamous "Error 37", which forces players to repeatedly login to their accounts. "Please note that due to a high volume of traffic, login and character creation may be slower than normal," stated a message on the Diablo III login screen. "If you're unable to login to the game or create characters, please wait and try again. We've temporarily taken our Battle.net website offline and launched more servers to accommodate for the traffic. We hope to resolve these issues as soon as possible and appreciate your patience." Blizzard had previously warned players they could experience delays when logging in, but appears to have slightly underestimated Diablo III's launch day demand. Blizzard's requirement that players always be connected to the internet, even for single player, has more than likely exacerbated the problem. Currently, Blizzard has offered no ETA as to when they expect to have everything sorted out.